Endeavor’s process for strategic organizational renewal unlocks value in your business by optimizing organizational performance and protecting customer loyalty. By engaging this process, business leaders align near term business strategies to prosper. 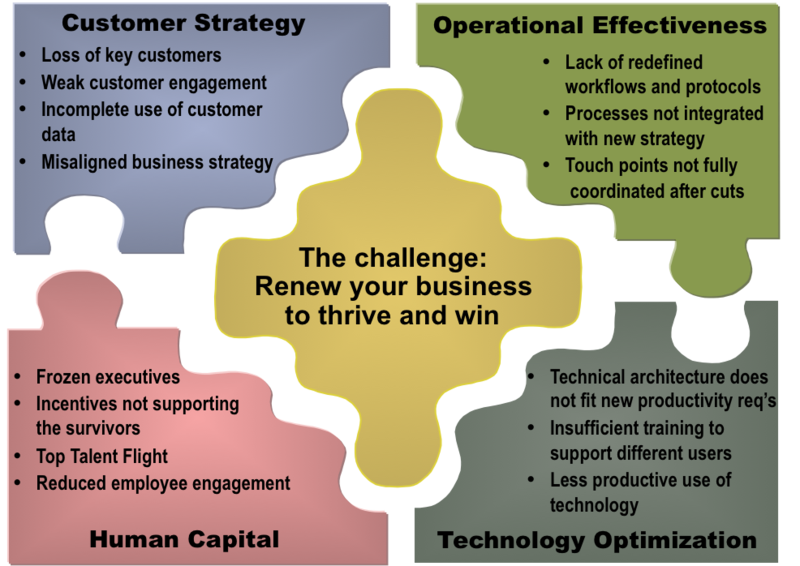 The following model highlights the different areas and associated challenges that your business faces. Endeavor can help you find an answer for each of these uniques challenges that your organization is facing. Align today’s business strategy with customer expectations by gaining a deeper understanding of their needs, wants, behaviors and expectations. In doing so, you can protect important, high value customers with strategies that build confidence in your abilities to deliver. Engage employees in the renewal effort. You will turn anxiety into energy for positive change by aligning rewards and incentives to keep key talent motivated to sustain the renewed enterprise. Use this opportunity to build strong internal leaders, recruit new top talent and engage every member of your team in succeeding today while renewing for tomorrow. Ensure the dramatic changes in the marketplace and your organization are reflected in how business is done. Make opportunistic process change while aligning technology. This will help you drive out non-value added activity, hand-offs and productivity saps by optimizing process and technology to perform today.